I eagerly await the day that computerized transcription becomes cheap and reliable enough that human-transcribed audio disappears. Google is getting close. I have my reasons, but succinctly: podcasts need to be transcribed to be searched by text-search engines. I have been busy. But in a good way. I recommend drinking Westmalle Trappist 8 while watching In Bruges while eating goat cheese brie. The Skor-covered cupcake at Cafe Divano is buttercreamy ectasy. Big City Cupcakes sells stylish, yucky, overpriced cupcakes. TLO has pointed out that I've lost over $100 in pants and shorts in the last 30 days. Professionally, I spent three weeks agonizing over an important milestone in a high-profile project. Then I solved that and two other notable problems in the first three hours of work today. I am going to curate an exhibit on the history of video games. Since all twenty of my readers are (collectively) smarter than me, I thought I'd put my research notes here. I can't cover the whole history of video games in four display cases, no matter how small I make the type, or how long I make the interpretive audio clips. What I can do is highlight a few themes that I hope will excite an audience that has almost certainly played video games without thinking hard about the nature of video games. While in Greece, TLO and I chanced upon a fairly wretched made-for-TV movie, The Loretta Claiborne Story. If the phrase "Camryn Mannheim vehicle" doesn't scare you off, I assure you some combination of the writing and the non-Mannheim acting (notably Kimberly Elise, doing an undertalented job in the titular role) ought to. Regardless, TLO and I were, at that moment, pretty desperate for something in English. So we watched. The movie was terrible, but the true story it tells was amazing. Loretta Claiborne was, and I'm not joking, the greatest Special Olympian ever. She has six gold medals and various silvers and bronzes in a variety of events from the half-marathon to bowling to figure skating. She apparently continues to train in even more events. ...is not featured in any beer ads. It's not Robert Norman Smith. It may be Theodore Roosevelt. He wrote a definitive text on naval warfare while he was in university. He had about ten jobs. He was a first-class performer in about five or six more fields than should properly be possible. And he not only survived an assassination attempt, he correctly diagnosed that the open gunshot wound was not grave, and proceeded to give his scheduled speech before seeking medical attention. Here's to Theodore Roosevelt, who did not do things by half-measures. This after a pilot project to improve hand-washing compliance in a small number of hospitals. NYT has the story: before the project, 50% compliance; now, 75%. Why is this interesting? In the US there's 90,000 deaths due to health-care-associated infections every year. Unwashed hands are a major vector for these infections. It's a multi-billion dollar problem, again just in the US. This short report [pdf] on the project is interesting throughout. The numbers are amazing, the final goal (90+% compliance) is still in the distance, and the practical approaches to getting there are at turns fascinating and bizarre. Lean Six Sigma approach to hand washing? Really? The Vancouver Art Gallery occupies a leftover courthouse from 1905. Vancouver's main public library branch is a big, practical box full of books with a nonsensical facade patterned after the Colosseum. Meet Edmonton's new Art Gallery of Alberta. 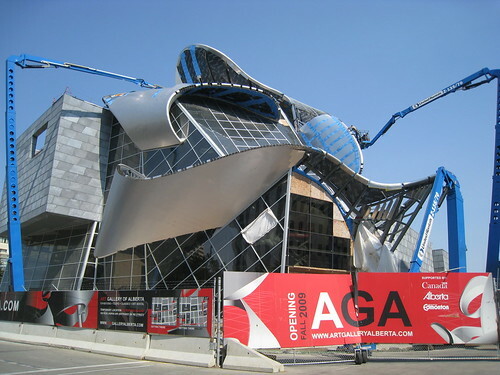 It's not a Gehry ripoff, honest! The architect who designed it spent much less than a decade in Gehry's office. (Via Colby Cosh). I have an imaginary evil twin, named Beau. Beau is a very wicked alter ego, and does all sorts of things I wouldn't contemplate: devilish advocacy, reading Ayn Rand novels, trying to get pregnant women to drink more. Anyways, the other day I was talking to Beau about health care, and Beau seemed eager to engage me. I of course believe that medicine is great, but Beau, well, he reads a lot and then sometimes I think he says things just to annoy me. Why do you hate Cuba so much, anyway? Good health care, you know, world class. Okay, so what about Costa Rica, then? They spend about 1/16 what the US does on health care and they live just as long as average Americans. Apropos of nothing at all, here's a list of consumer goods I don't need, but would enjoy tremendously. camera bag to hold one SLR, one other lens, and a big honking flash. Kensington Expert "Mouse" trackball. Seriously, why is the best trackball ever made called a mouse?